Well, project management seems to be a serious word, doesn’t it? You probably hear a lot of buzzwords about complicated processes taking place in large companies, helping to “facilitate”, “co-ordinate” and “budget” the work of employees. All of this, to make the projects run more efficiently, helping the organization grow faster. But does project management need to be so serious? Is it something dedicated for large teams and companies? I believe project management is simply the way we work and communicate with each other and should help us make our daily work better and more effective, so that we save more time for other important things in our lives. Let me show you how you can build a transparent and effective team without complicated project management frameworks. Project management? We thought it’s something we should think about in advance. 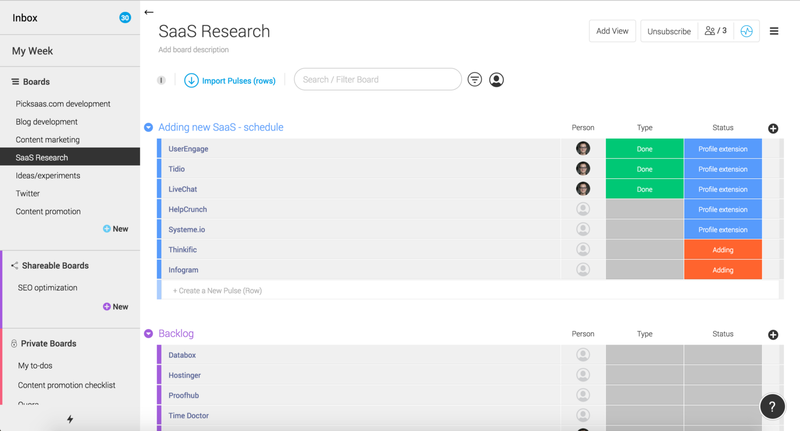 So when planning our software research @ pickSaaS, we decided we should plan everything ahead. We have scheduled in detail: which SaaS software we’re going to analyze, who is responsible for which tool, when we plan on delivering. Pretty much everything didn’t work out according to the plan, we’ve quickly realized there are tons of other stuff to do around the software research, like figuring out the proper screenshots resolution, setting up the platform for testing installation or solving tons of other ongoing problems. The effect? We didn’t deliver on the deadlines and we’ve quickly become demotivated, unable to meet our goals. Of course, meanwhile everybody stopped using our project management tools and Gantt charts as they simply became useless. You’re probably familiar with that situation when everybody stop using the tool and all you can do to make them use it is to chase them. Not nice, is it? 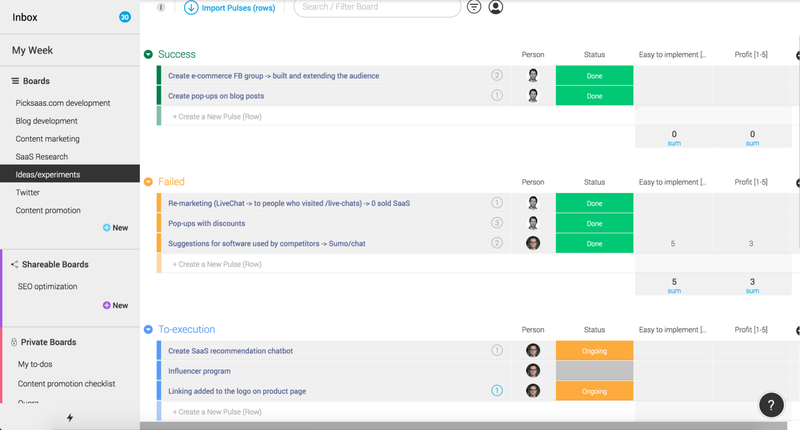 Our initial approach to project management became a bottleneck to our style of work. Instead of helping us succeed, it simply slowed down our work and started to limit our creativity. It’s quite obvious that “project management” should help us be more effective and support our communication and daily work. So we took an alternative approach. 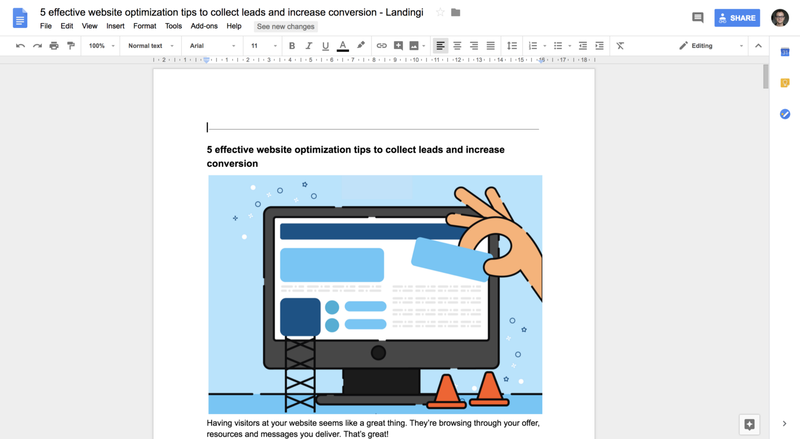 When setting up a plan for our blog posts’ publishing, we’ve set up simple goals for ourselves, to publish blog posts according to our current content plan. We had a plan to launch one blog post every 2 weeks. This time, we didn’t use any Gantt charts or project management tool, we simply sat down to work. What happened this time? We started to communicate on our Slack and quickly discovered, it might be better to communicate and update ourselves another way, to have easy access to the ongoing information, instead of simply sending the messages in Slack channels. Handling multiple tasks at once, we realized it might be smart to plan ahead our content publishing and set some dates. Isn’t the work more pleasant when you start with the way you want to work and choose the set of tools to support you in this process? We find it way more beneficial for the whole team when the tools actually support us in our work instead of being a distractor and hearing the team saying: “Sorry, I don’t have time because I need to fill in the required data in the CRM/project management app”. At this moment, we discovered monday.com, by researching the software for our users. After recommending it in one of the blog posts, we thought: why not implement it within our team and use it on a regular basis? Project management academy for beginners. How to do it in less complicated way? Let me show you one of the ways to set-up project management in action within your company, team, side-business, startup or any other thing you’re currently up to. No matter which method you’d like to go with, it will still require some planning. But instead of planning every activity within your project, just go ahead with splitting it into 2–3 main parts. Why should you do this? Planning is all about finding the proper balance. If you plan too heavily, you will likely not stick with it. If you don’t plan anything, you will experience chaos. Let me show you how we managed our recent implementation of the chatbot project we launched — our Facebook profile bot which messages you software recommendations after you comment on the post. So there’s been only one checkpoint on the project before the launch when we gathered together to see if everything works correctly. It’s not worth controlling every step of the project. Don’t limit your creativity, instead count on your team’s responsibility and readiness. The next thing is to simply start working on your tasks which lead to the project’s success. You’d probably say — that’s it? No detailed planning? No splitting the project into detailed things and going into each and every step? While the process of planning is crucial to your success, setting very detailed plans might simply turn into a failure. You don’t want to have your team demotivated with stress, unachievable deadlines and micro management. You’d rather have your team excited, respected and make everybody have some free time to spend on other things, even it it’s just browsing through some funny stuff online 😉 Just plan the main milestones, divide overall responsibilities and make it work. When you start your work, you will likely realize there are many ways you could use to improve the way you communicate with your team members. Just as an example, you might need to find the way you share files between each other. It’s not the best idea to do it on Slack as you’d rather be able to locate the files easily, anytime you need them. No matter whether you choose monday .com or simple Google Drive to do it, it will be something that helps you organize your work and will support your communication with a team. The best way to keep the motivation high is to update regularly. This do not need to be long meetings, going through the agenda and detailed results. Instead, write a message on your project’s Slack channel about the small success you’ve achieved during the day. When setting up a meeting, make it quick and turn them into brainstorming. Maybe there are new ideas worth sharing which can be implemented in the meantime? Trust your teammates, keep motivation high and make the tools work for you. You will never be more happy with your projects and the invaluable time you save for yourself, teammates and a family. So having said all of that, you might wonder how it looks like in our project? We’re still a very small few people team, but modern technology helps us be more effective and stay motivated. Let me show you how we use software to make the most out of our daily work and to keep ourselves motivated. Slack is our basic tool for daily communication. We have quite a few channels that help us in our daily communication. For larger releases (like our ongoing pickSaaS tips #bot project) we typically set up a new channel to make sure we have all the communication in one place. When starting small projects, we’d rather not open a new channel if we can still communicate in the existing ones. That helps us not to become distracted with too many places to search for the information. Also, one of the things we really love about Slack is that it’s integrated with our Revolut account, so any payment we receive or pay (we mostly pay for using SaaS software, e.g. Mention), we get a notification about it within Slack channel. monday.com is extremely helpful in organizing our work better and keeping all the things we need in one place. An option to simply come back to our work plan after some time is just invaluable and helps us analyze our results. One of the most often used boards to help us is the “Ideas/experiments” tab, where we brainstorm new ideas, assess them, plan the impact and turn them into reality. 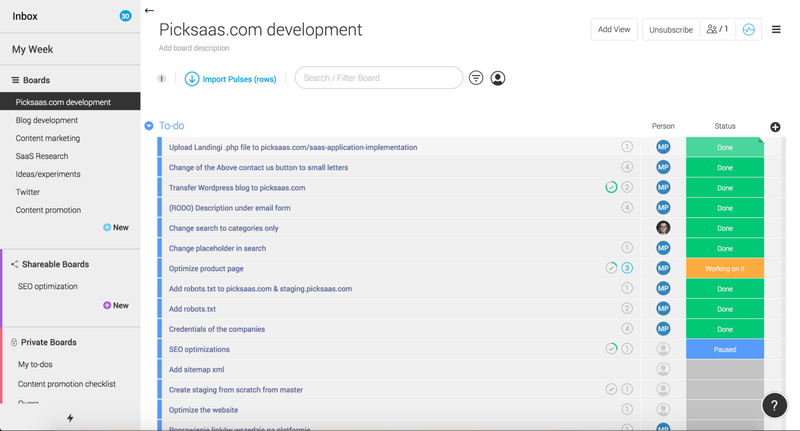 Another one we use heavily is “SaaS Research”, where we list the software to be researched, reviewed and added to pickSaaS. All the projects involve some sort of documentation, which can be graphics, texts or presentations. 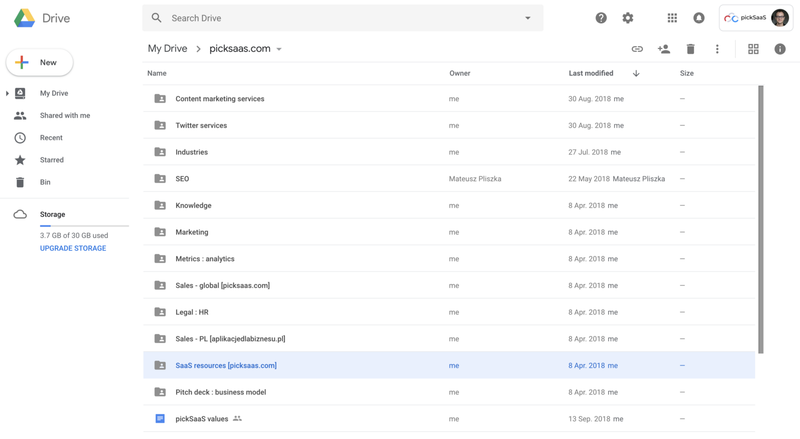 Google Drive / Google Docs is our basic tool helping us to have everything stored in one place. You will find there everything related to our company, beginning from our team’s values/mission, ending with invoices and legal documentation. We also use real-time collaboration a lot. Leaving comments to the text with the automated notification to other person turns out to be extremely helpful, especially when working remotely. No matter if you’re running a small side project in 2-people team or launching a new innovative product in a huge organization. It’s always about making 1+1=3. So the more you co-operate, the better the outcome. Luckily with modern technology, you get access to the whole set of tools which can support you and your team in your communication.